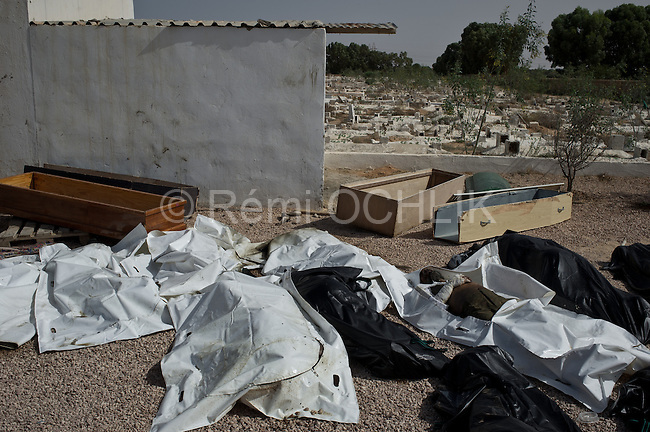 Remi OCHLIK/IP3 - LIBYAN ARAB JAMAHIRIYA Sirte : .Volunteers from Sirte take DNA samples as they bury in mass graves around 300 peoples found in the ruins of the city on October 25, 2011. The bodies of more than 50 people who are believed to have been supporters of ousted Libyan leader Colonel Muammar Gaddafi were found at a hotel in Sirte last week, Human Rights Watch reported on Monday. The 53 decomposing bodies were found in the garden of the Mahari Hotel in Sirte on Friday, a day after Gaddafi was captured near Sirte and eventually killed. But the decomposing state of the bodies indicates the group was killed about a week earlier, between October 14 and October 19..Libya's new leaders began the tough task of forging an interim government uniting the nation's disparate political forces after 42 years of Moamer Kadhafi's iron-fisted rule, promising a system of Islamic sharia law.